Roger Brook - the no dig gardener: Is the no-dig-gardener still not digging? For someone who posts as a no digger I have recently written very little about it. It’s just that over the last two years I have run parallel series on the detrimental effects of digging and another on why gardeners dig. The ‘why dig’ series took a broad definition of digging and included most of the legitimate (and also rather less usual) reasons why gardeners disturb the soil. I have not changed my mind and all those writings are as relevant now as when they were written. I do not want to repeat myself (well not too much!) and will help you at the end of this epistle to find posts that you might have missed. Initially their titles did not indicate the actual content and I am starting to amend them. 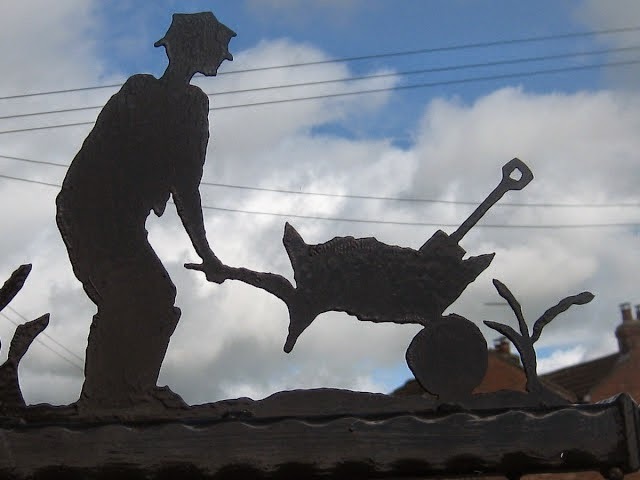 Is it appropriate that a man with a spade is the house name logo on our home? I have been a none digger nearly 45 years and my thinking has changed in one small way in recent years. Although I still shudder at the sight of fluffed up and loosened soil and cringe at the harm unnecessary soil disturbance creates, I am not as doctrinaire as I used to be when I used to think almost any soil breakup was a sin! Damage to soil’s structure happens. I have indicated many legitimate reasons for ‘using a spade’ such as planting, dividing, lifting root crops and burying things (not normally soft vegetation, nature does that for you). My own soil gets loosened by the wretched rabbits and moles! I just kick it back and it sometimes looks tidier than my liverwort. Soil is actually very resilient. It has to be when you consider the dreadful things gardeners do to it! I once pondered doing a post about the legitimate uses of a spade. 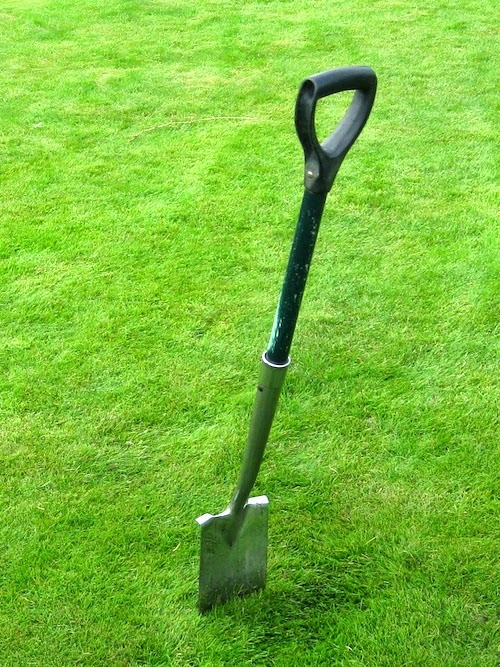 My small stainless steel border spade is my favourite tool – but in my own gardens never for conventional turning over! There are a myriad of operations you can do with a spade such as planting, dividing, scraping, edging, shallow hoeing, chopping out, digging holes and mixing compost. The uses are endless but I don’t want to bore you. A recent visiting party was perplexed and could not understand what a no dig garden must be. They asked Brenda “does he rotavate?” Some gardeners never get past the false notion that soil management is only one step removed from playing with buckets and spades on the beach! I should no longer fear that the world is against me! My informants tell me that some great TV gardening gurus have recently stated that ‘no dig’ is the future for amateur gardeners. I am sometimes asked if no dig is so good, why do farmers plough and cultivate to smash up their soil? My first answer is that many growers of perennial crops such as fruit don’t do much cultivation. I also point out that fewer farmers now leave their roughened soil exposed to the so called ‘beneficial’ effects of the Winter and very soon after harvesting the next crop goes in. Farmers now generally cultivate less deeply albeit interspersed with an occasional ‘deep busting’ of plough pan compaction. My second answer is that farmers are a conservative bunch and everything in their world is built around conventional ploughing. Machinery and equipment is not geared to none cultivation. Perhaps closer to the truth is that cultivation enables rapid turn arounds between one crop and another. Sheer brute force can be used to carry out operations at specific times when contractors are available. No matter if soil structure is destroyed by heavy equipment on wet land when harvesting. It can be broken up again by the next cultivation. It might use a great deal of energy but farming methods do work and produce very high yields. As Jethro Tull discovered all those years ago. There are certain weeds not easily controlled in farming without conventional cultivations. Direct drilling into fields of cereal stubble was once thought to be the way forward, especially facilitated by burning, but we don’t like smoke and fire. Unfortunately decaying stubble produces natural herbicide toxins - the same ones that kill algae when gardeners float barley stubble on their ponds. I have the same trouble when I have accidents with glyphosate on my lawn. Just scattering grass seed onto the fresh yellow patch does not work! Even in farming - especially outside the UK - there is much interest in no till methods. We have recently taken to walking local public footpaths over the fields. It has been such a nice Autumn but very wet. Some of the footpaths across fields are ploughed and cultivated and then reinstated as the law obliges. What a wet podgy mess to walk on! Contrary to popular opinion, cultivation does not usually improve drainage - not unless severe compaction already exists and pans need loosening. Very often such compaction is the consequence of previous cultivation! Only lone signposts registered our way. You were actually walking on water soaked fields of newly sown cereal or grassland. Our feet sank in and caused structural soil damage and we got very muddy wellington boots. No wonder conventional gardeners are instructed to never walk on wet soil. To me the biggest advantage of minimum cultivation, is that you can walk and work on firm settled wet soil whenever you want to without causing any damage at all. What a contrast when we walked on footpaths where it had been pasture for several years. It was firm and well aerated and surplus water had run rapidly away through all those un-smashed natural worm and root-made channels. I must qualify this statement because whether you cultivate or not, drainage only takes place if water has somewhere to drain to. Sometimes ease of water penetration is only half of the story and land drains are needed. The farm field next to my own garden is ploughed once a year. 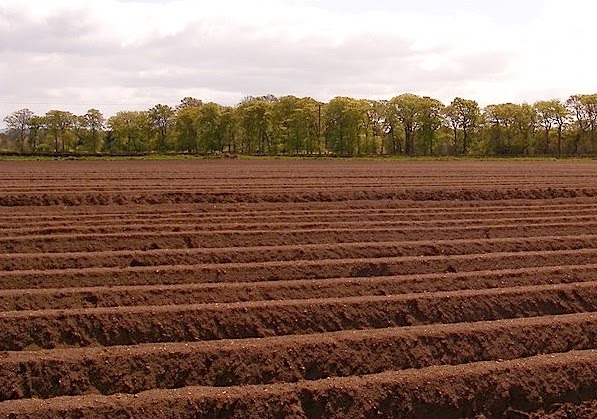 The soil has benefited by a year of none cultivation before it is due to be ploughed again. In the garden, no dig advantages come through slowly in the same way. Unlike the farmer, don’t spoil it by digging and your soil will improve year on year. My post on mycorrhiza explained how these fungi can establish in none dug soil. Essential in nature, I wonder how many mycorrhiza actually get going in a highly fertile garden soil. Even when un-dug. How to find my previous posts on ‘reasons to dig’ and the ‘reasons why not’. To find previous posts about digging, go to the search box at the bottom of the blog scroll. (The box at the top gives far more limited results). Merely insert either the single words ‘reasons’ or ‘why’ to find them all! Re the potatoes - you should perhaps use one of those forks with big flat tines. Morning Mark. I think you and Sue are inventing problems for me when I don't have one! I agree Mark that sometimes to have exactly the right tool for a job is fundamental. Even lifting potatoes if you do it all day, but not just digging up dinner! As if Mark and I would create a problem for you Roger. I was asked to speak at a farmers convention in Ontario--about gardening, mostly for the spouses who did not want to attend the farming talks. But it allowed me to sit in on farming talks, and I was surprised at how hard they work and using no-till, essentially a no dig system. They very much understand the benefits of no dig on for some crops, and on certain types of soil they need to dig. In our climate, cultivation also helps dry out soil in what is a fairly short season. A couple of weeks earlier plants can make or break a crop yield. As far as this topic goes, farmers are far ahead of most gardeners in understanding the value of no-dig. I would probably list a soil drying out after cultivations as a disadvantage, yet as you quite rightly suggest, ones person's disadvantage is another's raison d'être. As to your last paragraph it is the opposite over here! In my post on microbes, http://www.gardenmyths.com/soil-microbes/#more-1796 , I had a comment as follows. I agree that rototilling or hoeing will alter the soil structure and this can lead to serious problems in some climates. However, this is not generic. I have the luxury of gardening in Britain where the climate is not severe and where digging does not cause too much damage. I replied that I did not know this about the UK, but that I would ask the no-dig gardener for his opinion. So here I am asking--is the climate in Britain so different that it does not cause soil structure damage? I am sure I know the answer, but I'll use your reply to rebuttal my viewer. Thank you Robert for inviting me to join the discussion on your excellent blog. I will shortly make a comment on your post. Of course our UK soils are subject to structural damage. I blog about it all the time! Your correspondent is right however that our soils are generally more resilient than in most parts of the world and probably correct that our climate lacks some of the extremes that might for example facilitate widespread water and wind erosion when soil is loosened by cultivations. This contributes, in my opinion, for our farmers to lag behind the no till methods in other parts of the world. Hi Roger, That was me talking to Robert. You know what I think about no dig.  As with all horticultural techniques there is no one right way of doing things. As I say on my blog I build soil both from the bottom and the top. The only reason for digging is that it gives me more opportunity to add organic matter to the soil. It takes hundreds of years to make one centimeter of soil naturally and I have not got time to wait. As to the structural damage to the soil by cultivation, I believe that this is more due to the loss of organic matter through increased rate of decomposition rather than mechanical damage. My understanding is that the soil structure is defined by the amount of sand silt and clay and how these aggregate. Damage it is suggested is caused by shearing and compaction forces. Well maybe if you are using a dirty great tractor but digging? After thirty four years I gave up my old allotment but it had been productive for all that time. All this on double digging! However, I don’t think it was the double digging that achieved this; it was the addition of copious amounts of organic matter in the form of logs, branches, leaves, turf, manure, compost, in fact anything that was once alive. This improved the soil structure because as you know organic matter improves water and air porosity by the formation of soil aggregates among other things. I've just been watching land reclamation videos on http://permaculturenews.org/ where land in China, Jordan and Ethiopia has been degraded by over grazing and loss of top soil by erosion. Both clay and organic matter are eroded first because they have the least bulk density. Some soils are very fragile and need to be used carefully for food production. However, these soils have been revived by large earthworks some of which were made using earth moving vehicles. Swales, terracing and water management all need large scale earth structures. All this earth moving did not seem to affect the rejuvenation of degraded soils. However, the common factors in all the reclamation were the need for water management and organic matter to be incorporated into the soil. My new allotments have very poor fertility and soil structure even though they have been fallow for about three years. I reckon that they have not had any additional organic matter added to them for even longer. Compared to my old allotment which had a top soil about a metre deep (after 34 years of double digging and adding organic matter) the top soil on the new allotments is less than a spit in some places. As I said I don’t have the time to wait for the soil to improve naturally. I think that building the soil from the top, when digging is unnecessary, by applying mulch, is just another technique in my repertoire for making a good soil. I absolutely agree that there are numerous successful ways to manage soil and in my blog I generally promote my own methods. I have often said privately that when it comes to vegetable growing, that in the hands of skillful practitioners, single digging versus no dig cedes similar quality results. I have also said that on many soils the double digger who adds masses of organic matter to his soil might achieve the best results of all. I once attended a lecture by a former horticulture professor who on his retirement relaxed by treble digging his soil. You should have seen his Brussel sprouts! (actually far too big for man or beast). Your comment about the slow development of natural soils has always puzzled me, although of course you are probably correct. When the grave digger at Bolton Percy brings up what appears to be pure sand from six foot down and deposits it on the surface within a few years I cannot discern much difference to the rest of the soil. Of course organisms mixing in worm casts etc and natural deposition of organic matter bring about the change. Forgive me as an over precise former lecturer to say that whilst I agree that how sand, silt and clay are aggregated together helps to define structure, the actual amounts of sand ,silt and clay define another more permanent property, that of texture! Sorry this is pedantic and I write it for general information and not to be a clever clogs! I think the biggest difference in our philosophy is that I have a rather perverse wish to be self sufficient on organic matter where you, I guess, take yours from where ever you can and rightly so. This is not sensible of me and of course I do sometimes buy bark mulch and as to nutrients, buy inorganic fertilizer. And I do bury wood sometimes and have followed your own posts on hugelkultur.! Many quality gardeners such as yourself HELENE don't do much cultivation either although they might not define themselves as no dig. Many excellent vegetable growers have not yet caught up! You really ought to do a post about your soil. You probably have. Your heavy mulching each year with bark is really interesting. Has the soil level raised over the years? How well is your original soil mixed by with the worms. How much do you use your soil in containers. I bet it is wonderful as a potting compost. What kind of bark? You are such a whizz with your camera how about some pictures of your soil or a video of your worms! Would be great if I could place a glass plate down in the soil and show the layers…..my mind is wandering off already. A perfect post for summer, when everything in the soil is most active. I never use garden soil in pots and containers by the way, I always use a mix of different types of bought compost. I have read that in such a fairly ‘closed’ environment as pots and containers you should always start with clean compost, garden soil is to full of just about everything you can imagine (and a lot you wouldn’t believe was there). Besides that, it is very heavy! I use small chipped bark from B&Q, it cost £20 for 4 bags, 150L each when on offer, the bark is pine bark, I have never done a soil test in my garden but all my acidic loving plants are doing very well so I assume I can (again) thank the bark for that! I will have a think about how to write a post about this, thanks for the tip, I think you have mentioned it before, I tend to concentrate on my plants as I have so many and just writing about them gives me ample writing material. I imagined your soil to be rather organic in nature with all that bark and just wondered. After all desirable factors in the ground can be good in large pots.As to the weight issue,that is a two edged sword. As we get older and tend now use lighter plastic containers using heavier soil gives me wind stability. Hi Roger, as always I have read your post with interest and have come to the conclusion that although I subscribe to the efficacy of your "no-dig" doctrine I would have to admit probably not for the right reasons. In years gone by I would single spit dig principally to bury organic matter and do things like re-plant herbaceous borders regularly. With the passing of time and lack of diligence, such practices slipped and I discovered the fact that I no longer did these things made absolutely no difference to the end result. A combination of "no-dig" and the use of chemical sprays to keep the garden in check with a little therapeutic hand weeding suits me down to the ground. In the farming world the gardener's time and effort translates into money which to me is the principal driver for a minimum cultivation policy rather than soil condition as cultivation costs money. From the days of horse drawn, low impact machinery, the advent of the tractor and the introduction of prairie-busting machinery which altered out landscape for ever (thank you John Deere!) economic arguments have always been the major consideration. The only example that springs to mind of an effort being made to conserve soil structure is in the management of fenland soils, but there again this was only to make them economically viable. The whole question of which road to take is so subjective that I am sure most people will go along with which they are happiest judged from the end result. Congratulations getting there, no matter the route! In fact most experienced gardeners move to no dig by your route!As I admit in my talk to Anthony Cuthbert there are many ways in gardening to get to a satisfactory end result. While I was aware of minimum cultivations and direct drilling, I hadn't though about non dig in the garden, until I read an article by the garden designer Bunny Guinness, relating how she had planted a new garden after spraying the grass with round up and then planting direct into the soil. Being by nature, a lazy person, this appealed to me. When we moved into this house the garden was mainly lawn, I did the same, planting it with plants from our previous garden, they all grew away extremely well. I now just add home made compost and leaf mould each spring. Have you ever read anything by Charles Dowding, Roger? he is a no dig guru with an excellent website. Yes I am an admirer of Charles Dowding - not sure what he thinks about me!